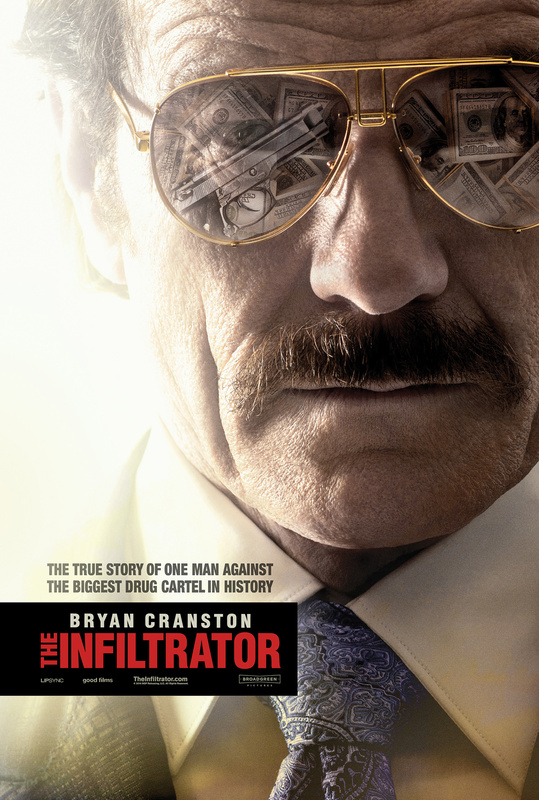 Like director Brad Furman’s 2011 film, “The Lincoln Lawyer,” his latest movie, “The Infiltrator,” is an assured piece of filmmaking that spins a familiar tale extremely well. This true-life story is a consistently engaging look at a man and woman living duel lives. Will they get in so deep that they forget who they are? Furman and screenwriter Ellen Sue Brown (who also happens to be the director’s mother) answer that clichéd question with genuine nuance and thrills. Set in 1985, Robert “Bob” Mazur (Bryan Cranston) – whose real-life counterpart worked as a consultant on Furman’s “Runner Runner” – is a U.S. Customs agent who’s given the chance to retire early and spend more time at home with his wife and kids following an injury at work. Instead, he pursues another job involving Pablo Escobar, who mostly remains in the shadows of this story. Posing as a successful money launderer named Bob Musella, he attempts to cripple Escobar’s organization by bringing down his top people, including Roberto Alcaino (Benjamin Bratt), a criminal that Bob befriends. Joining Bob on his undercover mission are agents Kathy Ertz (Diane Kruger) and Emir Ebreu (John Leguizamo), who must put aside their personal differences and work together in order to take down some of the world’s most powerful drug lords and corrupt bankers from the inside. Bryan Cranston, who co-starred in “The Lincoln Lawyer,” is fantastic as Mazur. Rarely do undercover agents in movies feel this vulnerable. Mazur isn’t played as an agent that can take out five guards without a problem, but he’s extremely competent and smart at his job, even if his smarts aren’t always enough for the job. Even in seemingly mundane conversations in “The Infiltrator,” death is only a few flubbed words or a wrongly remembered lie away for the character. The stakes are always high, and Cranston makes the audience feel those stakes in the briefest of moments sometimes. When Robert witnesses two murders, the actor doesn’t play it cool; his response is either of shock or horror. In these extraordinary situations, Cranston reacts normally. The actor helps make the reality and the sense of danger palpable, and the same goes for Kruger and Leguizamo. How can a movie about giant monsters be so boring? 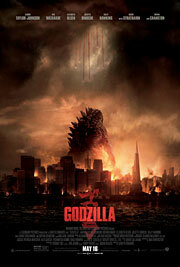 That’s the biggest question surrounding Hollywood’s latest attempt to bring the King of the Monsters stateside. Though not quite as bad as Roland Emmerich’s farcical 1998 version, “Godzilla” is a bewildering piece of blockbuster filmmaking, stuck somewhere between an old-school monster extravaganza and a po-faced thriller that’s almost afraid to have too much fun. Gareth Edwards may have seemed like the perfect director to revive the scaly beast on the big screen – especially for anyone who saw his 2010 indie, “Monsters” – but it’s possible that he was a little too right for the job, because what worked so well in that movie doesn’t have the same effect here. Of course, it doesn’t take a nuclear physicist to realize that a Godzilla film should probably have more, you know, Godzilla. The film opens with a lengthy prologue set in 1999 detailing how a mining company in the Philippines inadvertently awakened something deep underground, prompting the creature to leave its hiding spot for Japan, where it leveled a nuclear power plant that killed hundreds, including the wife of American scientist Joe Brody (Bryan Cranston). 15 years later, Joe is still obsessing about what happened that day, convinced it was more than just an earthquake. After he’s arrested for trespassing in the quarantine zone, his military son Ford (Aaron Taylor-Johnson) travels to Tokyo to bail him out of jail. Joe is adamant that he’s uncovered more evidence that not only confirms his original claim, but proves that it’s about to happen again, and before he can say “I told you so,” a pair of insect-like MUTOs (Massive Unidentified Terrestrial Organisms) burst from their cocoons and begin to wreak havoc. The military plans to lure the radiation-fueled MUTOs to a single location (tough luck, San Francisco) using a nuclear missile in the hope that they’ll be destroyed in the blast, but when the long-dormant Godzilla rises from the Pacific Ocean, Japanese scientist Dr. Ichiro Serizawa (Ken Watanabe) believes that nature has already provided them with all the firepower they need to stop the monsters. After all, Godzilla is a nice dude, and he’s more than willing to help.